A dragon and phoenix together symbolize the emperor and empress in China. The phoenix that is graciously presenting a peony, the sovereign of the flowers is embroidered with silk threads and the dragon is couched in gold wrapped threads. 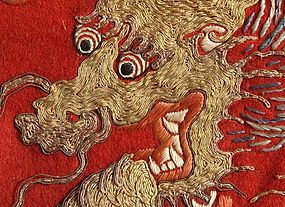 The trimming of the dragon’s face (and some area of the body) are copper (revealed underneath of gold) and silver wrapped threads. This is a beautiful, old and amazingly well preserved piece. The fabric on the front is made from baby camel hair, silk damask is on the other side. The flowers woven on the reverse side are all auspicious. The liner is more damaged than shown in the photos; torn and detached from the front in many areas. The dragon featured here is the four-clawed, called a mang. This panel was likely to be made at the time of a wedding or given at the birth. The exquisite work shown here was available only to limited number of people such as cetain princes, nobles and high ranking officials when this panel was made. The last photo shown here was taken under the sun light. It looked breath-takingly beautiful. All and all it looks a little darker and shows more patina than shown here. Dimensions: 18 3/8 inches x 18 3/8 inches.